Digging deep into a world of espionage, political theater and cyber-crimes is fascinating. Alyssa Milano teamed up with BOOM! Studios for Hacktivist, a book that combined all of the above. 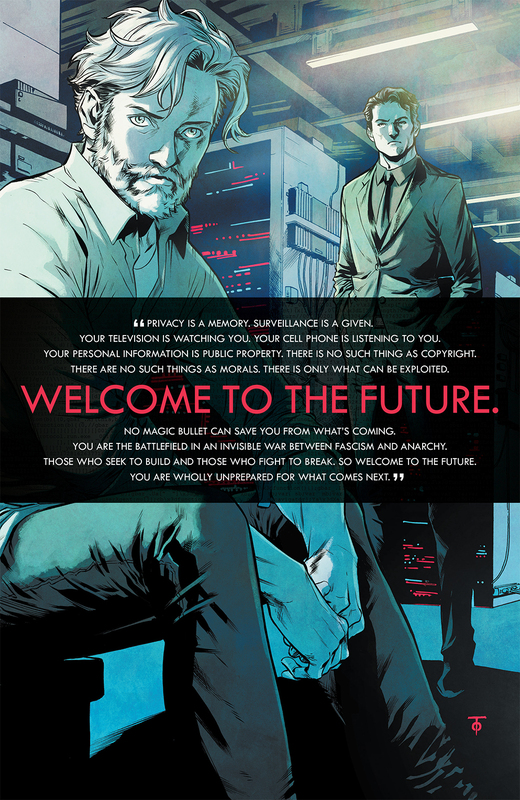 Now, they're revisiting the property in Hacktivist Vol. 2, set to debut in July. This go-round, writers Collin Kelly and Jackson Lanzing will team with Marcus To for a new limited series. It’s been six months since Tunis. Nate Graft’s life was turned upside-down after his best friend Ed Hiccox died, but he’s since pulled things together and is now in charge of VIGIL, the front line of America’s ongoing cyber operations. Just when things are starting to gain some semblance of control, YourLife, the government, and Nate come under attack by a new breed of hacker...who call themselves .sve_urs3lf. Using Nate and Ed’s former handle, they want to know the truth of what happened in Tunis, and they’re calling for blood. Nate’s blood. "I'm so happy to be able to continue to explore these special characters, their partnership, their friendship and their hacktivism,” said Milano. “It was great to work with this unbelievable team again and I can't wait for readers to experience this next chapter." Hacktivist Vol. 2 #1 (of 6) arrives in comic shops on July 29th with a main cover by To for the price of $3.99 under Diamond order code MAY151082. Also available in a limited quality is a 10 Years incentive cover by Sonny Liew and a retailer incentive cover by To. The Final Order Cutoff deadline for retailers is July 6th. Full press release below. July 2, 2015 (Los Angeles, Calif.) - Archaia, an imprint of award-winning publisher BOOM! 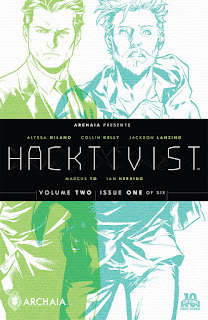 Studios, is pleased to announce the next installment of high-stakes danger in the hacker community with Hacktivist Vol. 2 #1, debuting this July. The team behind the critically acclaimed limited series is back as actress/activist Alyssa Milano teams up once again with writers Collin Kelly and Jackson Lanzing (Maze Runner: The Scorch Trials Official Graphic Novel Prelude), and artist Marcus To (New Warriors, Red Robin) for a new limited series that pits hacker against hacker. Hacktivist Vol. 2 #1 (of 6) arrives in comic shops on July 29th with a main cover by series artist Marcus To for the price of $3.99 under Diamond order code MAY151082. Also available in a limited quality is a 10 Years incentive cover by Sonny Liew (Dr. Fate, Jim Henson’s The Storyteller: Witches), and a retailer incentive cover by Marcus To. The Final Order Cutoff deadline for retailers is July 6th. Not sure where to find your nearest comic retailer? Use comicshoplocator.com or findacomicshop.com to find one! It’s also available for order directly from boom-studios.com.